Not many of us are born with a perfect set of teeth. Some people have aged or worn down teeth. Others have gapped teeth that may not be easily closed by braces. There are also those whose teeth have worn down edges, resulting in unevenness and lack of uniformity. Teeth are simply prone to plaque and bacteria and keeping them healthy and good looking can be quite a challenge over the years. A good solution to create beauty, symmetry and a uniform tooth color is the use of dental veneers. These are very thin porcelain shells placed over the teeth, to address a wide range of imperfections. Single to multiple dental veneers can be bonded onto your teeth for a great looking smile that exudes confidence. 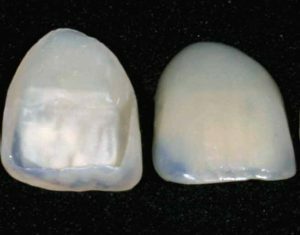 How Are Dental Veneers Bonded Over the Teeth? The dentist uses bonding cement to permanently attach the veneers over your teeth. But before this happens, the dentist needs to prepare your teeth for the procedure. This is done by removing a very thin layer of tooth enamel. This is a very important step so the veneers appear natural looking once bonded. Not removing a few millimeters of your enamel will result in protruding, unnatural looking teeth. Once the tooth is prepared, the dentist will take your dental impression and then send this model of your teeth to a dental laboratory. The lab will fabricate your dental veneers. Fabrication takes about 1 to 2 weeks to finish. During this time, the dentist will provide you with temporaries, so you are able to speak, smile, and eat comfortably while you wait for your veneers to be crafted. The final step is the bonding of the veneers over your teeth. The dentist begins the process by temporarily placing the veneers on your teeth to check their fit and appearance. He makes improvements by trimming the veneers as needed, to achieve perfection. Once the dentist is satisfied with the veneers, your teeth are prepared for the bonding procedure. Your teeth are cleaned and then etched with a solution to roughen their surface. This will make the veneers adhere easily and bond into place permanently. The dentist then applies bonding cement onto the veneers and places them over your treated teeth. He checks the outcome, adding final touches, removing excess cement, and polishing the veneers. You now have veneers bonded over your teeth creating a great looking, beautiful smile. Are Dental Veneers Used Solely for Cosmetic Purposes? Most people think that dental veneers only address cosmetic flaws of the teeth. However, they are also used to seal and protect surface damage of a tooth. This prevents bacteria from penetrating the tooth; thereby, restoring not just its appearance but also its health. The health and appearance of your teeth greatly improves with dental veneers. For dental veneers in Atlanta, GA, trust expert dentist, Dr. Jeffery Ballard of Buckhead Dental Partners. He is very skilled and creative in providing you with a beautiful smile makeover with the use of dental veneers. Dr. Ballard looks into your overall facial symmetry, to ensure that you get the smile transformation that you truly deserve!